If you are unhappy with your smile, porcelain veneers can provide you with a long-lasting solution. Veneers are ultra-thin pieces of porcelain that adhere directly to the front of your teeth to cover blemishes, chips or discolored teeth. They can also be used to close gaps and straighten mildly crooked teeth. Our doctors are highly experienced and trained in the placement of beautiful, natural-looking custom veneers. We can transform smiles in just a couple of visits. A key to beautiful veneers is working with the right lab. We use a local lab known for its excellent cosmetic work and high-quality materials. They use high-quality all-porcelain e.max® or Empress® veneers which are two of the most durable, lifelike ceramics available. These veneers are strong and durable so we are able to create thinner veneers, which means less shaving down of the tooth surface. 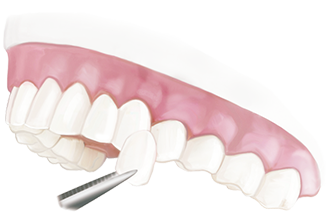 Our metal-free veneers are biocompatible and highly resistant to stains and bacteria. Some of our patients might be candidates for Lumineers®. This type of porcelain veneer is very thin so little or no tooth structure has to be removed for placement over existing teeth. Depending on tooth structure, Lumineers can be an excellent cosmetic solution for stained, chipped, discolored or misaligned teeth. 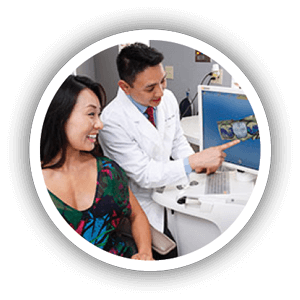 In our Poway office, we use the CEREC design and milling machine to create same-day veneers right in our office while you wait. In just one visit, you’ll walk out with a brand new smile. 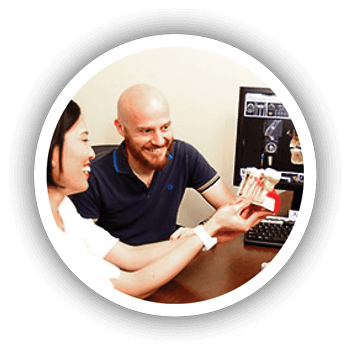 Learn more about CEREC here. In our San Diego office, we offer same-day veneers to patients getting multiple veneers. The veneers will be designed and created by our lab and placed by the doctor in one day. No temporaries or follow-up visits are required. 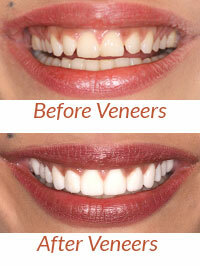 Traditional veneers are placed over the course of two visits. Treatment always begins with thorough diagnostics, including digital X-rays and intraoral and extraoral photos of your smile. These images help us to plan your procedure. 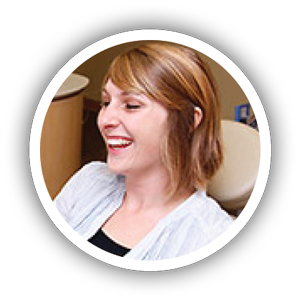 You will have the opportunity to look at our before and after photo gallery of previous patients to help you determine how you want your new smile to look. 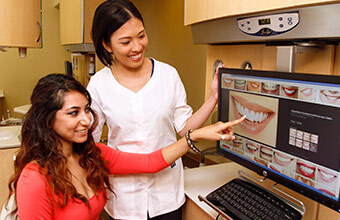 An impression of your teeth will be made so that we can create a study model of your smile. This model will be used to make sure that your teeth are well aligned and the bite is correct. For multiple veneers, we may also create a “wax-up” model of your teeth in order to show you just what the final result will look like before any work on your teeth begins. The doctor will prepare your teeth and take impressions that are sent to the lab. He or she will then place temporary veneers that you will wear for about two weeks while the final veneers are being fabricated. In our Poway office, we use the CEREC design and milling machine to create custom veneers right in our office while you wait. No temporaries are necessary. 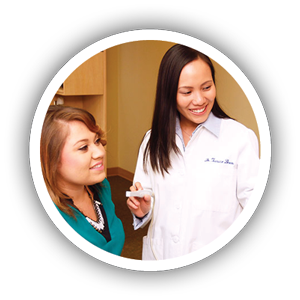 In our San Diego office, we offer same-day veneers to patients getting multiple veneers at the same time. In that case, temporary veneers are also unnecessary. Your final veneers are permanently bonded to the tooth with a resin or composite adhesive, holding them securely in place. Each veneer is handcrafted to either match your other teeth or to transform your smile with a natural-looking white color that complements your face. The doctors will double check the work to make sure that your veneers fit perfectly, feel comfortable and look beautiful. Dental bonding is a tooth-colored resin that is applied to the tooth in order to cover up small cosmetic flaws. Bonding can fix small gaps or chips in the teeth, make them look even and improve their color. 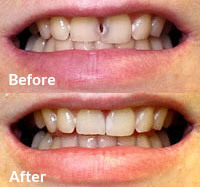 It is an economical but less durable alternative to porcelain veneers.